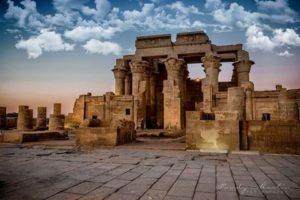 Today, you will drive to the beautiful temples of Edfu and Kom Ombo, which were built during the Greek_Roman period in Egypt. The city of Edfu is in the midway between Luxor and Aswan. It is about 110 K.M from each city. It is famous for the Greek temple of the falcon headed god Horus. Edfu was known as (Behdit) “where the god was exalted” in Ancient Egypt. Its temple is one of the most intact temples in Egypt. It was begun in 237 BC and finished after 180 years. It was dedicated to the God Horus (Apollo) and his festival “the Beautiful Union”. You will approach the temple by the Mamisi or (the birth house) . 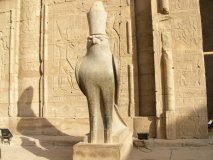 There are some amazing scenes as the first pylon and on the inner rooms such as: the festival scene, the foundation scene and the famous scene of the battle of Horus and Seth. Kom Ombo or (the hill of gold) is famous for its temple and the sugar factory. 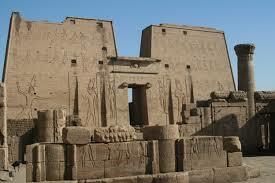 The temple is smaller than Edfu, was built as well in the time of Greeks and Romans. It was dedicated to Horus and Sobek, that’s why the temple looks like two temples united in one, with two sanctuaries . It was very famous as sanatorium, so that there are seven medical clinics in the back of the temple. The 1st part of the temple is cut off by Muhammad Ali to construct the sugar cane factory. Among the beautiful scenes in the temple is the most exciting scene of the surgical tools. A nilometer to measure the level of the flood is to the left of the temple. A crocodile museum was recently built in the vicinity of the temple with some crocodile mummies. Child under 12 is 50% discount of the price. All prices in US Dollar, but Egyptian Pound, English Pound & Euros are accepted.